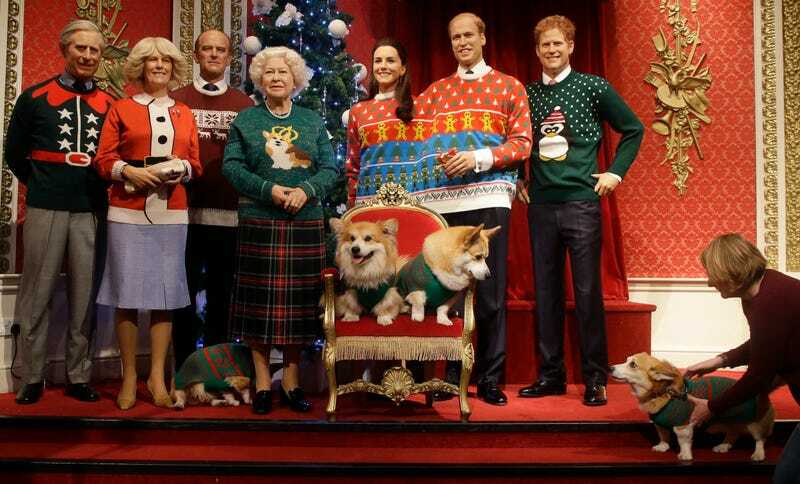 Madame Tussauds London has decked out their collection of alarming Windsor waxworks in Christmas sweaters, rendering the group somehow even more alarming. People reports that the Palace actually signed off on this display, as it’s technically a promotion for the charity Save the Children and their Christmas Jumper Day fundraising campaign. Of course, that’s what an advance guard of terrifying waxy aliens plotting an invasion that starts Christmas Eve around 8pm GMT would say, now isn’t it? “We are delighted to support Save the Children by having our royal wax figures join in with the Christmas Jumper Day campaign in a seriously stylish way,” said the attraction’s inexplicably unbothered general manager Edward Fuller. “Who knows, maybe the Queen will feel inspired to do her annual speech in a more laid-back get-up this year?” added the charity’s Helena Wiltshire. Guys—are you not seeing what I’m seeing, here? They aren’t fooling that very real corgi in the corner, though. He knows something is wrong, but his human handler won’t take him seriously, probably because of his very festive but very silly sweater. Which Relative Will Embarrass You at Thanksgiving as Badly as the Prime Minister of Antigua Just Did Prince Harry?